The United States Military has a variety of label specifications that must be followed when shipping products to their destinations and every container and package you ship to the DoD or GSA must have a label. A problem with the label can and will result in returned shipments, missed deadlines and possibly the loss of the government contract for your company. ImageTek Labels can help make the labeling process easy-to-follow by providing you military grade labels that comply with any specification or setting you up with the printer, ribbon and labels to print them yourself, on demand. MIL-STD129P is among the more popular packaging and shipping standards specifications. Military Standard 129P is the most common standard when shipping freight to government or military destinations. The standard makes both linear and 2D codes mandatory on all shipments. Though meeting the standard can be challenging at first, once the label format is well understood, the rules apply to all shipments of that unique part and only limited information will change. The most important thing to remember when trying to meet MIL-SPEC 129P standards of compliance is that there are only two types of labels. The first label is used to identify units or intermediate containers, the second is used to identify exterior containers. When working with MIL-STD 129P w/ change four, it is important to note the substrates resistant properties. 5.1.2 Labels, paper, pressure-sensitive, water-resistant. Labels shall be of a water-resistant grade of paper, film, fabric, or plastic,coated on one side with water-insoluble, permanent type adhesive. The adhesive shall adhere to metal, plastic, aluminum orfiberboard surfaces under high and low temperatures. Labels shall have a finish suitable for printing and writing on with ink without feathering or spreading, be capable of withstanding normal handling and storage conditions, and remain securely in position. Application specific performance criteria and durability requirements to ensure functionality in various climatic environments should be tailored, if required, using MIL-PRF-61002. MIL-PRF-61002 can be used as an acquisition tool when labels presently being used are not performing satisfactorily or when new conditions or applications require special label stock for those particular situations. Identification bar code labels on exterior containers shall meet the requirements of paragraph 4.4.1.10.
applicable), methods of preservation code, date of preservation, with clear text. Shelf Life Marking – indicates the start of the shelf life and the date the item needs to be replaced or disposed of. The item is only called out for on items that have an expiration date. Serial Number barcode(s) – All serial numbers must appear in a barcode format and be in clear text. Serial numbers are only issued by the government, for means of identification, not by the manufacturer to specify quantity, date of manufacture, or other. ALL Interior containers will use the same label format unless the label needs more than five serial numbers. In that case an exterior container label rule will apply. Exterior Packaging Labels use the same format is interior container labels but they do not require and item description. Also, the NSN, Contract Number and CAGE code must be barcoded. This can be done on one large label or by using two labels, placed side by side. Additional Labels may be required on external packaging for items like..
Military Shipment Label (MSL) – The MSL lists the “To”, “From” and “Mark For” address information and transportation control number (TCN). A barcode is required on this label for the TCN, DODAAC mark, and Piece numbers. Also, a 2d code will be placed on the label A current version of this standard can be found in the DD1387 specification. This label will also include a 2d barcode that encapsulated all the information on the label, making processing easier for the department receiving the package. When is MSL Labeling NOT required? “Unless specifically exempted in the contract or solicitation, DoD and contract-or-vendor shipping activities will apply address markings using a bar coded MSL. This includes shipments moving with CONUS, between CONUS and OCUNUS, or conversely between OCUNUS and CONUS.” (MIL-129P-1). Foreign Military Sales (FMS) require marking with the MSL. 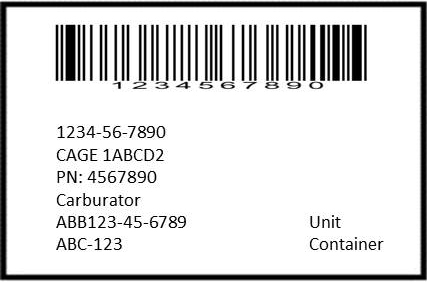 Direct Vendor Delivery (DVD) Label– This label has only three barcodes . The requisition/document /transportation control number label, made up of one barcode. The NSN and composite barcode made up of quantity, unit of issue, routing ID code, condition code, distribution code and unit price. All address labels must meet this compliance standard unless otherwise specified in the contract or solicitation. A MIL-STD129P shipping label is required on each individual pallet and each individual box. Standard MIL-STD 129P labels sizes are 4″x 6″ but custom sizes are available in both RFID and non-RFID. ImageTek Labels can print these for you or set you up with everything you need to print them in house.